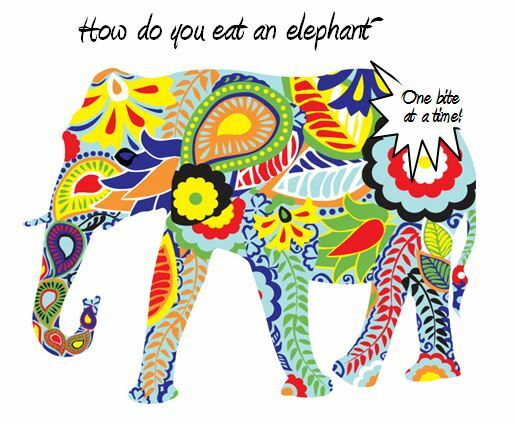 Success :: How do you eat an elephant? The only way to accomplish a big goal is to break it down into smaller goals that can be measured by time and performance. If you don’t know where you are going, you’re going to end up somewhere else. Woodrow Wilson explained the significance of dreaming this way in “Timing is Everything” by Waitley. I started a book called the Solomon Secrets by Dr. Robert Jeffress last month. It draws principles from the book of Proverbs and how to experience God’s best for your life. Here is an overview along with questions Dr. Robert Jeffress asks in the book to help us clarify a purpose, objectives and concrete goals! Successful people know where they want to go in life and have a plan for getting there. Where do you want to be in ten years? Dreams are important, but they are not sufficient to change life. A dream without a plan is only a wish. King Solomon, the wisest man who ever lived, had a clear objective for his career. He wanted to build a magnificent temple for the worship of God. His life was filled with significant accomplishments, including the extension of the wall of Jerusalem, the fortification of the cities of Hazor and Megiddo, the reorganization of the nation into twelve districts, and the vast increase in the nation’s financial resources. But none of these objectives happened by accident. Solomon understood the importance of developing a plan. That is why his collection of proverbs is filled with reminders about the importance of planning. God has given us exactly the amount of time we need – no more, no less – to achieve the dreams He has placed in our hearts. Three key words to translate dreams into reality: purpose, objective and goals. First, your life purpose should involve something you feel passionate about. What needs in the world concern me? If I could meet any one need in the world, what need would I meet? What are the most urgent needs in my country, my community, my work, my school, and my church? What age group or type of people naturally interests me? What are the major needs among my neighbors, my friends, and my family? Second, your life purpose should involve something for which God has given you special gifts. What abilities do you have that others tend to notice and affirm? If you could give a “how to” seminar to a group, what topic would you choose? As you review your life, what five accomplishments have given you the most satisfaction? Why? What is the common denominator you find in the above experiences? What single word best describes the area in which you are both interested and gifted? On a scale from 1-10, how satisfied do you feel you are doing in these 7 major life areas? A goal is a desired accomplishment that is easily measured by time and performance. How are you going to reach your objectives this year? A desire “to become an author” is not a goal but an objective. However, “to write a book and have it published within three years” is a goal because it consists of a stated objective that can be measured by time and performance. Having a worthy purpose in life, formulating clear objectives, and establishing specific goals that will take you to your desired destination are the most fundamental, but most often overlooked, secrets of extraordinary success. Once again, these questions came from “The Solomon Secrets” by Dr. Robert Jeffress. I highly encourage you to read it if you want to know more about basic principles for success! Wishing y’all the best in 2014!